Start your Kids Spanish Journey today! Primeros Pasos currently offers preschool Spanish classes in preschools and homes in Boulder, Denver, Golden, Longmont, Louisville, Lafayette, Superior and Louisville. We engage kids Students through the use of music, movement, games, puppets, stories, hands-on activities and crafts. 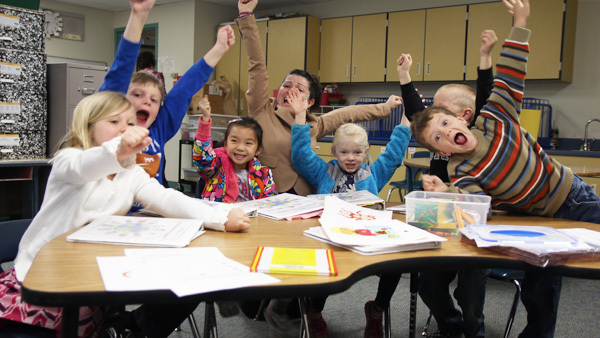 Primeros Pasos currently offers elementary Spanish classes in Elementary schools and homes in Boulder, Denver, Golden, Longmont, Louisville, Lafayette, Superior and Louisville. Kids learn Spanish through interactive games, storytelling, songs and arts and crafts. Our curriculum incorporates auditory, visual, and kinesthetic learning styles. Learning Spanish has never been so much fun! Our Primeros Pasos: Kids’ Fun and Interactive Spanish curriculum is a unique program that is used nationwide! Our program is designed to be an engaging and hands-on approach to learning Spanish through interactive games, storytelling, and songs. Primeros brings to your school or home highly experienced bilingual teachers whose passion is teaching Spanish to kids. They teach Spanish classes using the most updated and effective fun and interactive curriculum custom designed by Primeros Pasos. Primeros Pasos has been serving the front range of Colorado since 2011. I have worked with Primeros Pasos for about 3 years now. They have brought an array of great Spanish programs for preschoolers. We have been very happy with their services, they are easy to work with, and the teachers are excellent. “I found that the kids program has been entertaining, which is important when you are working with kids. I have also found that it has been something they have been able to build on class after class. My kids are excited to sing the songs, repeat what they learned, teach me. I found it to be a great experience.